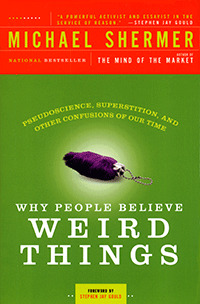 In Why People Believe Weird Things, Michael Shermer gives an insightful study of how people believe the claims of pseudoscience and paranormal activities, such as superstitions, alien abductions, and cults. He explains why these topics are so appealing to audiences around the world. His goal is to inspire people and inform them of the fallacies of irrational beliefs. The book is an interesting read. The first part of the book, “Science and Skepticism” includes details on skepticism and guides on how to identify suspicious scientific and historical claims. He makes a big distinguishment between a skeptic and a cynic. He explains a skeptic as an individual who questions the validity of a claim by challenging for more evidence, which may prove or disapprove said claim. Therefore, skepticism is an integral element of the scientific method. The rest of the book mostly consists of case studies. Shermer mostly explains what weird things people believe in, rather than explaining in depth of why people believe in them. As a historian, Shermer is well versed in evidence collection as well as analysis of that evidence. He uses this to debunk paranormal claims with a variety of evidence. Overall, I enjoyed reading this book. Reading historical accounts on all collective paranormal claims was interesting. I particularly enjoyed reading about the witch trials. The most alarming thing I found was about Holocaust deniers. It’s unsettling to know that Holocaust deniers exist when all evidence and facts prove that this event took place. In general, reading this book has granted me new insight on how to approach extraordinary claims with a grain of salt and seek out evidence before blindly believing.